HÀ NỘI – Prime Minister Nguyễn Xuân Phúc and his Canadian counterpart Justin Trudeau agreed to establish the framework of a comprehensive partnership between Việt Nam and Canada during their talks in Hà Nội yesterday. This marks an important milestone in bilateral ties, serving as a driving force to promptly step up friendship and extensive and productive cooperation at a time when the two countries have increasingly been sharing interests bilaterally, regionally and globally, they said. They agreed that the two sides will co-ordinate to realise contents in the comprehensive partnership framework across politics-diplomacy, trade-investment, development, education-training, national defence-security and science-technology. Both sides showed their appreciation at the positive development of bilateral ties across many fields. PM Phúc spoke highly of the immense contribution to relations between the two countries made by late Prime Minister Pierre Trudeau, Justin Trudeau’s father, affirming that Việt Nam treasures and wants to further its relationship with Canada. He said over the past two decades, Canada has always been among the top suppliers of official development assistance (ODA) to Việt Nam, and asked for the country’s further supply of this capital source, especially for poverty reduction, climate change response, agriculture and sustainable growth, and support for Việt Nam’s access to preferential loans after 2017. The host suggested Canada recognise Việt Nam as a market economy soon, further open its market to Vietnamese goods and provide more support for the Vietnamese community. Trudeau, who is paying an official visit to Việt Nam from November 8-9, described Việt Nam as an important partner of Canada in the region and wished to foster bilateral friendship and long-term co-operation. He committed to supporting Việt Nam in climate change response and promotion of sustainable development via the implementation of the 2030 United Nations Agenda for Sustainable Development. The guest pledged to expand academic exchange via establishing partnerships and student exchange programmes between the two countries’ educational establishments. The two leaders promised to continue working closely together at regional and global forums such as the UN, APEC, Francophonie, as well as on issues of shared concern. On regional and global issues, the two leaders expressed support to ensuring maritime and aviation security, safety and freedom in the East Sea, the peaceful settlement of disputes in the East Sea, full respect for diplomatic and legal processes, and international law, as well as promotion of ocean use for peaceful purposes, environmental and marine ecological protection. Following the talks, the two PMs attended a joint press conference. Later the same day, the Canadian PM was received by Party General Secretary Nguyễn Phú Trọng. Party General Secretary Trọng spoke highly of the bilateral relations between the two countries and expressed his delight that relations had been lifted to a new level – a comprehensive partnership – on this occasion. He proposed the two countries actively implement signed agreements and continue promoting relations more deeply, practically and effectively for the benefits of people of the two countries and for peace, stability, co-operation and development in the region and the world. Canadian PM Trudeau affirmed that Canada attached great importance to relations with Việt Nam and committed to strongly promoting co-operation in economy, science and technology and education. 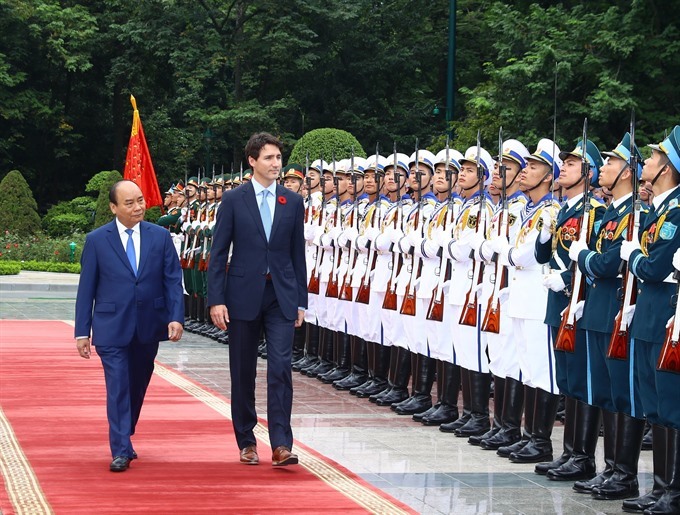 Later the same day, President Trần Đại Quang received Canadian PM Trudeau, lauding progress in bilateral relations, particularly in trade and investment and education. PM Trudeau hailed Việt Nam’s socio-economic development achievements and said the country is Canada’s top trade partner in Southeast Asia. On the same day, National Assembly (NA) Chairwoman Nguyễn Thị Kim Ngân received Canadian PM Trudeau, hailing the establishment of the countries’ comprehensive partnership as an important milestone. She took the occasion to thank the Canadian Government for its new projects worth more than US$43 million in total to help Việt Nam cope with climate change, ensure food safety and increase co-operatives’ capacity. PM Trudeau said on the basis of the fine relations between the two countries over the years, the two sides should continue developing co-operation, particularly as Canada and Việt Nam have established a comprehensive partnership framework.